A very simple one is a traffic light that signals importance or severeness of selected topics. 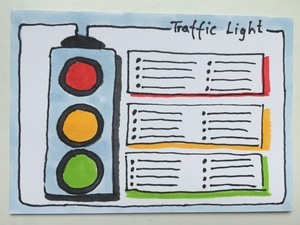 You can use the traffic light in order to structure results of a joint brainstorming or also to summarize the information from mindmaps. You can ask participants of a workshop to simply take their notes/comments and group them to either the red, orange or green light. This can be done with post its or also by writing it down next to the light. You can do a couple of loops until the final outcome is reached. 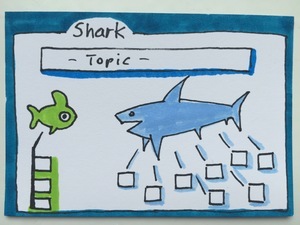 Another nice example is to use the metaphor of a shark – always used for danger or risk. We can use it for competition and facilitate a discussion about aspects characteristics that competitors have and which make them stronger than us. If you want to make this facilitation a little fun in contrast to the critical topic, you can have people draw small icons. The icons should represent characteristics or strengths. Those can be put into the stomach of the shark and immediately show the characteristics of the competitor. You can show a smaller fish in the ocean as well, which represents your company. You can add some icons there that stand for something that you achieve better than competitors. 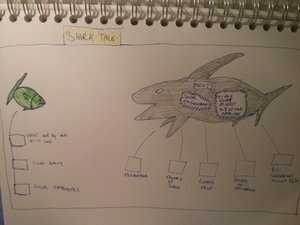 You can now start a discussion of what elements the shark will eat next – do you as a company still have certain strengths that safe you from being eaten from the shark or not?